i. 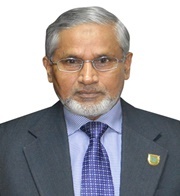 As Vice-Chancellor of the Hajee Mohammad Danesh Science and Technology University (HSTU) my aim is to develop this university into the status of an international standards in all academic, co-curricular and extra-curricular activities with help of all HSTU academic and non-academic staff as well as students. ii. As an individual I would like to practice all human values in establishing sincerity, honesty, integrity and justice in all academic and administrative matters of the university. Graduate Training Institute (GTI), BAU, Mymensingh. Directorate of Agriculture (E & M), Ministry of Agriculture, Dhaka. Kashem. M. A. (2014). Diversified Use of Mobile Phones by the Farmers in Bangladesh for Receiving Agricultural Information. Journal of Global Communication, 7(2): 112-119, July-December, 2014. Kashem. M. A., M. G. Farouque & P. C. Roy (2013). Impact of crop varieties on household food security in Haor areas of Bangladesh. International Journal of Agricultural Research Innovation and Technology, 3(2):7-11. Kabir, K. H. , M. A. Kashem & M. A. M. Miah (2013). The level of knowledge of nursery Owners in the Production and Marketing of Saplings. European Scientific Journal, 9(30):342-350. Kashem, M. A. (2009). Shifting from Personal Media to Mass, Interpersonal and Interactive Electronic Communication Media by the Farmers for Receiving Agricultural Information. Journal of Global Communication, 2(2). Kashem, M. A. (2006). Communication Strategies for Disaster Preparedness in Agricultural Sector in Bangladesh. Asia-Pacific Journal of Rural Development, XVI(2):77-96. Kashem, M. A., M. A. Hossain and M. S. Islam (2003) Job Performance of the Block Supervisors working in the Department of Agricultural Extension (DAE). Economic Affairs, 48(2):109 - 114, India. Hoque, M.J., K. Usami, A. Halim and M.A. Kashem (2003). Attitude of the Block Supervisors toward the Effect of Modern Agricultural Technologies on Environment - a case study in Mymensingh district, Bangladesh. Journal of Rural Problem, 39(1): 137 - 139, Japan. Islam, M. S. and M. A. Kashem (2001) The Level of Insecticide Use by the Selected Bangladeshi Farmers in Crop Production. Economic Affairs, 46(3):168 - 172, India. Kashem, M. A. and S. K. Podder (2000). Communication Behaviour of Mehersagar Banana Growers. The Journal of Communication Studies: 88 – 99. Kashem, M. A. and M. M. Hossain (2000). Farm Communication through Television in Bangladesh. Indian Journal of Extension Education, XXXVI(1&2): 65 – 68. Kashem, M. A. and M. M. Islam (1999). Use of Indigenous Technologies in Agriculture by the Rural Men and Women: An Empirical Study in Bangladesh. Journal of Sustainable Agriculture, 14(2): 27-43. USA. Islam, M. M. and M. A. Kashem (1999). Farmers’ Use of Ethno-Veterinary Medicine (EVM) in the Rearing and Management of Livestock: An Empirical Study in Bangladesh. Journal of Sustainable Agriculture, 13(4): 39-56. USA. Kashem, M. A., H. Mikuni and M. Z. Rahman (1998). Contact with Information Sources of the Japanese Farmers in respect of Organic Farming and Environmentally-Friendly Agriculture (EFA). Journal of Agricultural and Fisheries Economics of Hiroshima University, 8: 81-88. Japan. Kashem, M. A. and H. Mikuni (1998). Farm Techniques Used by the Japanese Farmers in Achieving Sustainable Agricultural Development. Applied Biological Science, 37: 39-52. Japan. Kashem, M. A. and H. Mikuni (1998). Agricultural Extension Services in Japan and Bangladesh: Lessons Learned and Future strategies. Journal of Agricultural and Fisheries Economics of Hiroshima University, 8: 49-80. Japan. Kashem, M. A. (1998). Social Development and Poverty Alleviation: A New Thrust of RD-9 Project. Economic Affairs, 43(1): 13-20. Calcutta, West Bengal, India. Chowdhury, M.S.H., M. A. Kashem and M.A.M. Miah (1998). Loan Utilization Behaviour of the Women Beneciaries of Grameen Bank: An Empirical Study in Bangladesh. Economic Affairs, 43(2): 160-167. Calcutta, West Bengal, India. Rahman, M. Z., M. A. Kashem and H. Mikuni (1997). Farmers’ Communication Behaviour for Technological Intervention: A Japan-Bangladesh Cross-Cultural Study. Journal of Interacademicia, 1(4 Spl. ): 277-290. India. Kashem, M. A., M. Z. Rahman and H. Mikuni (1997). Combating Environmental Degradation in Bangladesh: New Urge for Sustainable Agricultural Development. Applied Biological Science, 36(2): 115-130. Japan. Anwar, A.B.M. N., M. A. Kashem and S.G. Mahboob ( 1997). Interest, Participation and Time Use of Rural Youth in Selected Agricultural Activities. Indian Journal of Extension Education, XXIII (3&4): 81-89. Anwar, A. B. M., M. A. Kashem and M. M. Islam (1997). Participation of Rural Youth in Selected Household Activities in Bangladesh. Journal of Extension Education, 8(2): 1648-1653. Tamil Nadu, India. Lawrence, A., C. Garforth, S.C. Dagoy, A.S. Go, A. Hossain, M. A. Kashem, K.S. Krishna, V. Naika and J. Vasanthakumar (1996). Agricultural extension, the environment and sustainability: research in Bangladesh, India and the Philippines. Agricultural Research and Extension Newsletter, 33: 1-9. Overseas Development Institute, London, UK. Ali, M. O. and M. A. Kashem (1996). Relationships of Selected Characteristics of Rural Women with their Problem Confrontation in Working in Groups. Economic Affairs, 41(4): 250-252. Rahman, M. H. and M. A. Kashem (1995). Farmers’ Perception about the Growing and Marketing Problems of Oil Crops in Bangladesh – A Farm Level Study. Economic Affairs, 40(2): 106-111. Rahman, M. H. and M. A. Kashem (1993). Growing and Marketing Problems of Pulse Crops in Bangladesh. Economic Affairs, 38(1): 24-30. Calcutta, India. Kashem, M. A., A. Halim and M.Z. Rahman(1992). Farmers’ Use of Communication Media in Adopting Agricultural Technologies – A Farm Level Study in Bangladesh. Asia-Pacific Journal of Rural Development, 11(1): 94-112. Kashem, M. A. and M.Z. Rahman (1992). Communication Media Used by the Farmers in the Adoption of Rice Technologies: A Study in Bangladesh. The Journal of Development Communication, 2(3): 17-25. Kuala Lumpur, Malaysia. Kashem, M. A. and A. Hossain (1992). Adoption Behaviour of Sugarcane Growers. Indian Journal of Extension Education, XXVIII (1&2): 92-96. New Delhi, India. Kashem, M. A. and W.H.M. Jaim (1990). Possibility of self-sufficiency in Food through Rice Production in Bangladesh – Some Contradictions. Pakistan Journal of Agricultural Social Sciences, 3&4 (1&2): 55- 66, July 1988 to June 1990. PARC, Islamabad, Pakistan. Kashem, M. A. and G. E. Jones (1988). Small Farmers’ Perceptions of Obstacles to Improved Rice Cultivation in Bangladesh. Agricultural Administration and Extension, 29(4): 293-300. Elsevier Applied Science Publishers Ltd., UK. Kashem, M. A. and G. E. Jones (1988). Obstacles in Individual Innovation Decision-Making. Indian Journal of Extension Education, XXIV (3&4): 1-8. New Delhi: India. Kashem, M. A. (1988). The Rejection of Innovation. South African Journal of Agricultural Extension, 17: 11-14. Pretoria: South Africa. Kashem, M. A. (1988). Land Reform in Bangladesh. Land Reform, Land Settlement and Cooperatives, 1&2: 63-68. Rome: Food and Agriculture Organization of the United Nations. Kashem, M. A. (1987). Small Farmers’ Need for Institutional Credit in Bangladesh. Savings and development, XI (2): 181-190. Milano, Italy. Mahzabin, I. A., M. R. Rahman, M. A. Kashem and M. A. M. Miah (2014). Food Security of Farm Households and its Constraints in Mymensingh District of Bangladesh. Journal of Innovation and Development Strategy, 8(2):10-14. Kashem, M. A. (2013). Challenges in Higher Agricultural Education in Bangladesh. Progressive Agriculture, 24(1&2):61-68. Farouk, M. O., M. A. Kashem & M. Z. Rahman (2013.). Commercial Potato Growers' Contact with Information Sources through Mobile Phones. Progressive Agriculture, 24(1&2):239-249. Kashem, M. A., M. A. M. Miah, M. A. Islam & P. C. Roy (2012). Factors Responsible for Yield Gap of Wheat at Farmers' Field in Two Districts of Bangladesh. Progressive Agriculture, 23(1&2): 91-99. Mahzabin, I. A., M. A. Kashem, & M. A. Miah (2011). Household Food Security Status of Farmers in Selected Areas of Phulpur Upazila under Mymensingh District. Bangladesh Journal of Extension Education, 23(1&2):61-66. Mukta, M. Z. N., A.S.M.Z. Karim, and M. A. Kashem (2010). Cellphone Use by the Farmers in Securing Need-based Information, Bangladesh Journal of Extension Education, 22(1&2):7-14. Miah, M. S., M. A. Kashem and M. Z. Rahman (2010) Farmers' Preparedness for Combating Flood in Fulchari Upazila of Gaibandha District, 22(1&2):103-110. Ali, M. S., A. S. M. Z. Karim, M. A. Kashem and M. M. Islam. 2010. Case Studies of a Successful Ecological Farmer and a Successful ICM Farmer. Bangladesh J. Environ. Sci. 19:123-126. Mondol, M. A. S., M. A. Kashem, M. M. Ali and M. Z. Rahman (2009). Farmers' Constraints in Receiving Information from the Communication Media and Their Suggestions to Overcome the Constraints. Journal of Agroforestry and Environment, 3(2): 11-14. Mondol, M. A. S., M. A. Kashem, M. M. Ali and M. Z. Rahman (2009). Use of Mass Communication by the Farmers in Receiving Farm Information. Bangladesh Journal of Extension Education, 21(1 &2):9-15. Roy, B. S., M. Z. Rahman & M. A. Kashem (2009). Farmers' Perception of the Effect of IPM towards Sustainable Crop Protection. Bangladesh Journal of Extension Education, 21(1 &2):35-41. Karim, M. R., M. Z. Rahman & M. A. Kashem (2009). Farmers' Perception of Quality and Marketing System of RDRS Seed. Bangladesh Journal of Extension Education, 21(1 &2):73-81. Ahmed, N., M. Z. Rahman & M. A. Kashem (2009). Need Assessment for Capacity Building of Women in Practicing Post Harvest Activities of Vegetables. Bangladesh Journal of Extension Education, 21(1 &2):97-104. Barman, K.S., M. A. Kashem, M. Z. Rahamn & M. A. S. Mondol (2009). Use of Mobile Phone by Farmers in Receiving Agricultural Information from the Input Dealers. Bangladesh Journal of Extension Education, 21(1 &2):93-96. M. A. Islam, M. A. Kashem, M. A. M. Miah, J. Nain & Shamima Begum (2009). Farmers' Knowledge on Yield Contributing Aspects of Modern Boro Rice Cultivation. Bangladesh Journal of Agricultural Science and Technology, 6(3&4): 51-54. Ali, M. S., A.S.M. Z. Karim, M. A. Kashem and M.M. Islam (2009). Correlates of Problems Faced by the Farmers in Using Ecological Agriculture. Bangladesh Journal Environmental Science. 16:131-138. Mukta, M.Z.N., A. S. M. Z. Karim and M. A. Kashem (2008-2010). Use of Cellphone by the Farm People. Bangladesh Jornal of Training and Development, 21-23(1&2):33-42. Islam, M. A. & M. A. Kashem (2008). Yield Gap of some High Yielding Varieties of Boro Rice. Bangladesh Journal of Agricultural Science and Technology, 5(1&2): 51-54. Islam, M. A., M. A. Kashem & M. A. M. Miah (2008). Alternative Cropping Pattern for Drought-Prone Areas in Bangladesh. Bangladesh Journal of Agricultural Science and Technology, 5(1&2): 43-46. Ali, M. S., A. S. M.Z. Karim, M. A. Kashem and M.M. Islam (2008). Adoption of Ecological Agricultural Practices b the Farmers. Bangladesh Journal of Extension Education, 20(1&2): 49-57. Amin, M. D., M. A. Kashem & M. Z. Rahman (2008). Participation in Diversified Income Generating Activities by World Vision Beneficiaries. Bangladesh Journal of Extension Education, 20(1&2): 9-18. Islam, M. A., M. A. Kashem, M.A.M. Miah & M. Z. Rahman (2008). Management Gap in Boro Rice Cultivation at Farmers's Fields. Bangladesh Journal of Extension Education, 20(1&2): 91-97. Rahman, M. Z., M. A. Kashem, M. H. Rahman & A.B.M.A. Haq (2008). Peoples Participation in Coastal Biodiversity Management Activities in St. Martin's island. Bangladesh Journal of Extension Education, 20(1&2): 109-116. Muttalib, M. A., M. A. Kashem & M. A. Islam (2007). A Scale to Measure Farmers' Attitude towards Integrated Plant Nutrient Management. Bangladesh Journal of Extension Education, 19(1&2):11-18. Rokonuzzaman, M. M. A. Kashem (2007). Changes in Livelihood Status of Farmers due to Meghna-Dhonagoda Irrigation Project. Bangladesh Journal of Extension Education, 19(1&2):19-26. Haq, A.B.M.A., A.S.M.Z. Karim & M. A. Kashem (2007). Farmers' Knowledge on Arsenic Related Problems of Environment. Bangladesh Journal of Extension Education, 19(1&2): 27-32. Muttalib, M. A., M. A. Kashem & M. A. Islam (2007). Farm Management Orientation of Farmers in Haor Areas of Northeast Bangladesh. Bangladesh Journal of Extension Education, 19(1&2):51-56. Kabir, M. H., M. Z. Rahman & M. A. Kashem (2007). Effect of Monga on the Livelihoods of Landless Rural People. Bangladesh Journal of Extension Education, 19(1&2): 63-70. Muttaleb, M. A., M. A. Kashem & M. A. Islam (2007). Farmers' Attitude Towards Integrated Plant Nutrient Management. Bangladesh Journal of Agricultural Sciences, 34(2):185-190. M. N. I. Sarker, BM. A. Kashem & M. Z. Rahman (2007). Poverty Alleviation of Rural People through Chars Livelihoods Programme. Journal of the Bangladesh Society for Agricultural Science and Technology, 4(3&4): 203-208. Hasan, M. K., M. Z. Rahman and M. A. Kashem (2006). Participation of Male and Female Conventional Farmers in Farming Activities. Bangladesh Journal of Extension Education, 18(1&2): 57-65. M. N. Haque, M. A. M. Miah, M. A. Kashem & M. A. Muttaleb (2006). Adoption of Selected Modern Rice Varieties by the Farmers in Some Areas of Mymensingh District. Bangladesh Journal of Extension Education, 18(1&2): 89-96. Farhad, A.K.M., M. A. Kashem & M.A.M. Miah (2005). Knowledge of Rural Women on IPM in Vegetable Cultivation. Bangladesh Journal of Training and Development, 18(1&2): 27-36. Kashem, M. A, & M. Mamun-ur-Rashid (2005). Usefulness of Training Received by the Youths. Journal of Agriculture and Rural Development, 3(1&2):137-42. Rokonuzzaman, M. & M. A. Kashem (2005). Impact of Meghna-Dhonagoda Irrigation Project on the Changes in Crop Cultivation and Related Activities. Bangladesh Journal of Agricultural Sciences, 32(1):57-62. Rokonuzzaman, M. & M. A. Kashem (2005). Changes in Housing, Health and Sanitation after Implementation of Meghna-Dhonagoda Irrigation Project in Matlab Upazila under Chandpur District. Bangladesh Journal of Agricultural Sciences, 32(1):63-66. Kashem, M. A. (2005). Factors affecting the adoption of aquaculture technologies by the farmers. Bangladesh Journal of Fisheries, Special issue, 9(1): 77-79. Amin, M.R., M. A. Kashem & S. Samsuzzaman (2005). Behavioural Changes of Resource Poor Farmers towards Organic Cocoon. Bangladesh Journal of Extension Education, 17(1 &2): 75-80. Rashid, M.M. & M. A. Kashem (2004). Improvement of Socio-personal Traits of Youth through Training from Youth Training Centre. Bangladesh Journal of Extension Education, 16(2): 99-105. Rahman, M.S. & M. A. Kashem (2004). Relationships of Selected Characteristics of Potato Growers with Their Problem Confrontation. Bangladesh Journal of Extension Education, 16(2): 93-97. Mortoza, M.G., M. A. Kashem & M. M. Islam (2004). Use of Agricultural Information Sources by the Group Members of Krishak Samabaya Samity (KSS). Bangladesh Journal of Extension Education, 16 (Special Issue): 83-88. Miah, M.A.M. & M. A. Kashem (2004). Role of Women in Food Security Condition of Bangladesh for the Improvement of Livelihoods. Bangladesh Journal of Extension Education, 16 (Special Issue): 69-76. Kumar, R., M.A. Hossain and M. A. Kashem (2004). Farmers' knowledge on environment in using modern agricultural technologies. Bangladesh Journal of Extension Education, 16(2): 53-59. Kashem, M. A., M.A. Sarker, S. Zaman & M. M. Haque (2004). Food Security Status in Bangladesh in the Context of Sustainable Livelihoods Improvement. Bangladesh Journal of Extension Education, 16 (Special Issue): 49-60. Kashem, M. A. , M. A. Hossain & Z. Haque (2004). Attitude of Rural Women in Homestead Vegetable Cultivation towards Livelihoods Improvement. Bangladesh Journal of Extension Education, 16 (Special Issue): 77-82. Hamidi, M. A. M. A. Kashem, A.S.M.Z. Karim & M. M. Islam (2004). Adoption of Integrated Pest Management practices in Rice Cultivation by Farmers. Bangladesh Journal of Extension Education, 16(2): 1-8. Haider, M.R., A. Halim and M. A. Kashem (2004). Variables contributing to farmers' attitude on modern T. aman rice cultivation programme. Bangladesh Journal of Extension Education, 16(2): 67-74. Farhad, A.K.M., M. A. Kashem, M. A. M. Miah & A. H. Chowdhury (2004). Use of IPM Practices in Vegetable Cultivation by Women Farmers. Progressive Agriculture, 15(1):31-38. Farhad, A.K.M. & M. A. Kashem (2004). Attitude of Rural Women towards Using IPM Practices in Vegetables Cultivation. Bangladesh Journal of Extension Education, 16(2): 75-83. Nuruzzaman, M., M. A. Kashem & M. Z. Rahman (2003). Use of Mass media in Receiving Agricultural Information by the Farmers. Bangladesh Journal of Extension Education, 15(1&2): 95-99. Mortoza, M. G. ,M. A. Kashem & M. M. Islam (2003). Use of Agricultural Information Sources by the Group Members of Krishak Samabay Samity (KSS). Bangladesh Journal of Extension Education, 15(1&2): 75-81. Miah, M. A. M. , G.K. Das & M. A. Kashem (2003). Farmers' Feedback of Information related to Rice Cultivation in Two Villages under Mymensingh District. Bangladesh Journal of Extension Education, 15(1&2): 67-73. Kashem, M. A., M. A. Hossain and M. S. Islam (2003). Job Performance of the Block Supervisors working in the Department of Agricultural Extension (DAE), Bangladesh. Economic Affairs, 48(2):109-114. Kashem, M. A. , M. M. Rahman & M. Z. Rahman (2003). Relationships of the Selected Characteristics of Farmers with their Use of Television in Adopting Selected Technologies. Bangladesh Journal of Extension Education, 15(1&2): 63-66. Islam, M.S., M. A. Hossain, M.A.M.miah & M. A, Kashem (2003). Adoption of Modern Agricultural Technologies by the Farmers of Sandwip. Bangladesh Journal of Agricultural Sciences, 30(2):331-337. Hossain, M. A., N. C. Suttradhar, M. A. Kashem & M. A. Sarkar (2003). Farmers' Awareness on environmental degradation caused by the use of modern agricultural technologies. Bangladesh Journal of Extension Education, 15(1&2): 41-45. Hossain, M. A., M. Z. Haque and M. A. Kashem (2003). Attitude of Rural Women Towards Poultry Raising and Goat Rearing Activities of Homestead Agriculture. Bangladesh Journal of Agricultural Sciences, 30(1):179-186. Hossain, M. A., M. H. U. Sardar, M. A. Kashem & M. A. Sarkar (2003). Adoption of IPM practices by the RDRS beneficiaries under PETRRA project. Bangladesh Journal of Extension Education, 15(1&2): 1-6. Haider, M. R., A. Halim & M. A. Kashem (2003). Variables Contributing to Farmersâ€™ Knowledge on Modern T. Aman Rice Cultivation Programme. Bangladesh Journal of Extension Education, 15(1&2): 137-144. Kashem, M. A., M. N. Islam and M. A. Hossain (2002). Factors related to Job Performances of the Block Supervisors in the DAE. Bangladesh Journal of Training and Development, 15(1 &2): 67 - 73. Kashem, M. A. (2002). Impact of a Rural Infrastructure and Community Development (RICD) Project in Poverty Alleviation in Bangladesh. Bangladesh Journal of Extension Education, 14(1&2): 89-95. Hasan, M. M., M. A. Hossain and M. A. Kashem (2002). Satisfaction of Women Beneficiaries on Grameen Bank Rural Development Activities. Bangladesh Journal of Extension Education, 14 (1&2): 35 - 39. Kashem, M. A. (2002) "Role of Educational Institutions in Implementing NAEP: A Review". Background paper: Proceedings of the National Workshop on Implementation of the New Agricultural Extension Policy: Achievements and Constraints. Published by the Agricultural Extension Society (BAES). Kashem, M. A. , M. A. Hossain & M. S. Islam (2001). Factors Responsible for Determining Communication Behaviour of the Block Supervisors. Bangladesh Journal of Extension Education, 13 (1 & 2 ): 137 - 142. Kashem, M. A. & M. S. Islam (2001). Information Sources by Farmers regarding the Use of Agro-chemicals. Bangladesh Journal of Extension Education, 13 (1 & 2 ): 71 - 75. Islam, M. S. & M. A. Kashem (2001). Farmers' Attitude towards Judicious Use of Agro-chemicals in Crop Production. Bangladesh Journal of Extension Education, 13 (1 & 2 ): 23 - 27. Haider, M.R., A. Halim and M. A. Kashem (2001). Adoption of Improved Package of Practices for Transplanted Aman Rice Cultivation. Bangladesh Journal of Nuclear Agriculture, 16&17:77-84. Bari, M.A., M. A. Kashem & M. Z. Rahman (2001). Attitude of Farmers towards Hybrid Rice Alok 6201. Bangladesh Journal of Extension Education, 13 (1 & 2 ): 1 - 7. Shah, M. M. Islam, A. Halim & M. A. Kashem (2000). Comparative performance of GO and NGO led farmer field school in a selected area of Mymensingh district. Bangladesh Journal of Extension Education, 11 &12 (1&2):107 -114. Poddar, S. K. & M. A. Kashem (2000). Use of extension contact media by the farmers in the adoption of mehersagar banana. Bangladesh Journal of Extension Education, 11 &12 (1&2):89-94. Kashem, M. A. and M. M. Islam (2000). Comparative analysis of Bangladeshi and Japanese farmers' perception of benefits of using indigenous farm technologies. Bangladesh Journal of Extension Education, 11 & 12(1&2):23-32. Islam, M. S., M. A. Kashem, A. S. M. Z. Karim and M. W. Zaman (2000). The Level of Fertilizer Use by the Farmers in Crop Production. Bangladesh Journal of Environmental Science, 6: 146-152. Islam, M. S., M. A. Kashem & M. R. Islam (2000). Correlates of farmers' perception of the harmful effects of agro-chemicals on environment. Bangladesh Journal of Extension Education, 11 &12 (1&2):41-52. Islam, M. S. M, A. Kashem & A. S. M. Z. Karim (2000). A scale to measure farmers' attitude towards judicious use of agro-chemicals in crop production. Bangladesh Journal of Extension Education, 11 &12 (1&2):135 -140. Hanif, M. A., M. N. Islam and M. A. Kashem (2000). Comparative analysis between FFS and Non-FFS farmers regarding environmental awareness. Bangladesh Journal of Extension Education, 11 &12 (1&2):33-40. Mortuza, M.G., M. A. Kashem & A. Halim (1999). Formation and Use of Effective Farmers' Groups in Extension Work under the DAE in the 21st Century. Proceedings of the Symposium on Agricultural Extension services in the 21st Century: Needs and Challenges, pp. 95-106. Kashem, M.A., A.B.M.N. Anwar, M.M. Islam & M.A. Hossain (1999). Attitude of Farmers Towards the Use of Indigenous Technical Knowledge (ITK) in Agriculture. Bangladesh Journal of Agricultural Sciences, 26(1): 105-109. Kashem, M. A. (1999). Potentials for Privatizing Agricultural Extension in Bangladesh in the 21st Century. Proceedings of the Symposium on Agricultural Extension services in the 21st Century: Needs and Challenges, pp. 113-120. Kashem, M. A. (1999). Farmers' Contact with Information Sources in Using Farm Technologies. Bangladesh Journal of Training and Development, 12(1&2): 61-68. Islam, M.S., M. A. Kashem & A.S.M. Ziaul Karim (1999). Judicious Use of Agro-chemicals for Sustainable Agricultural Development in the 21st Century. Proceedings of the Symposium on Agricultural Extension services in the 21st Century: Needs and Challenges, pp. 157-166. Hamid, M.A., M. A. Hossain & M. A. Kashem (1999). Use of Modern Practices in Potato Cultivation. Bangladesh Journal of Agricultural Sciences, 26(2):323-330. Sarker, G. C., M. A. Kashem and M. A. Hossain (1998). Relationships of Selected Characteristics of the Poultry farmers with their Problem Confrontation. Bangladesh Journal of Training and Development, 1(2): 54-63. Mortuza, M.G. M.A. Kashem &A. Halim (1998). Relationships and Influence of Group Characteristics and Organizational Factors upon the Effectiveness of Krishak Samabay Samity (KSS). Bangladesh Journal of Extension Education, 10(1 & 2):75-80. Kashem, M.A. (1998). Use of Indigenous Technical Knowledge (ITK) by the Farmers: Path to Reach Sustainable Agricultural Development. Bangladesh Journal of Extension Education, 10(172):27-43. Kashem, M. A., M. M. Rahman and M. A. Haque (1998). Problems Faced by the Resourceless Women in Participating in Group Activities. Bangladesh Journal of Agricultural Sciences, 25(1): 77-81. Kashem, M. A. (1998). Comparative Use of Personal Localite, Personal Cosmopolite and Mass contact Media in Using Indigenous Technical Knowledge (ITK) by the Farmers in Bangladesh. Progressive Agriculture, 9(1 & 2): 1-12. Hasan, F., M.A. Kashem & M.R. Haider (1998). Organizational Problem Confrontation of the Block Supervisors in Supervising Result Demonstration. Bangladesh Journal of Extension Education, 10(172):51-57. Hasan, A.F.M., M. A. Kashem and M. R. Haider (1998). Personal and Situational Problem Confrontation of the Block Supervisors in Supervising Result Demonstration. Bangladesh Journal of Training and Development, 11(1&2): 23-32. Hamidi, M.A., A.S.M.Z. Karim & M.A. Kashem (1998). An Overview of Integrated Pest Management Activities in Bangladesh. Bangladesh Journal of Extension Education, 10(172):99-111. Uddin, M. A., M. H. Rashid and M. A. Kashem (1997). Relationships of Selected Characteristics of Sugarcane Growers with their Perception of Information on Sugarcane Cultivation. Bangladesh Journal of Extension Education, (Special Issue): 121-126. Karim, M. L., M. A. Kashem and A.S.M.Z. Karim (1997). Relationships of Selected Characteristics of Kakrol Growers with their Problem Confrontation. Bangladesh Journal of Training and Development, 10(1&2):49-54. Islam, M. M. and M. A. Kashem (1997). Attitude of Farmers Towards the Use of Agro-chemicals. Bangladesh Journal of Training and Development, 10(1&2):23-28. Anwar, A. B. M. and M. A. Kashem (1997). Participation of Rural Youth in selected Agricultural Activities. Bangladesh Journal of Extension Education, (Special Issue): 11-20. Akanda, M. G. R., M. A. Kashem and M. M. Rahman (1997). Problem Confrontation of the Farmers in Mukta (BR 11) Rice Cultivation regarding Plant Protection Measures. Bangladesh Journal of Extension education, (Special Issue): 133-138. Akanda, M. G. R., and M. A. Kashem (1997). Relationships of Selected Characteristics of Rice Growers and their Problem Confrontation in Using Quality seed. Bangladesh Journal of Agricultural sciences, 24(2): 87-91. Anwar, A.B.M.N. M.A. Kashem & S.G. Mahboob (1996). Opinion on Management and Financing of the Rural Youth Programme by Fathers of Rural Youth. The Journal of Rural Development, 26(1): 119-128. Uddin, M.A., M.H. Rashid & M. A. Kashem (1995). Perception of Information of the Farmers in Sugarcane Cultivation. Bangladesh Journal of Training and Development, 8(1&2): 141-143. Kashem, M. A. and M. Z. Rahman (1995). Relationships of selected Personal and Economic Attributes of the Block supervisors with their Credibility as Communicators. Bangladesh journal of training and development, 8(1&2): 34-41. Bashar, M. K., M. A. Kashem, A. Halim, A. S. M. Z. Karim and N. Ara (1995). Relationships of selected Characteristics of Sugarcane Growers with their Adoption of Intercropping in Sugar Mills Zone. Bangladesh Journal of Sugarcane, 17: 91-97. Anwar, A.B.M.N. & M.A. Kashem (1995). Participation of Rural Youth in Selected Income Generating Activities. Bangladesh Journal of Agricultural Sciences, 22(1): 185-192. Akanda, M. G. R. and M. A. Kashem (1995). Relationships of Selected Characteristics of Mukta (BR 11) Rice Growers with their Problem Confrontation in using fertilizers. Progressive Agriculture, 6(2): 139-143. Kashem, M. A., M. Z. Rahman and K. M. M. Islam (1994). A Study on the Block Supervisors: Their Roles, Perception about Supervisors and Satisfaction. Bangladesh Journal of Training and development, 7(1): 17-23. Anwar, A. B. M., M. A. Kashem and S. G. Mahboob (1994). Participation of Rural Youth in Selected Agriculture and Income Earning activities: An Empirical Study. The Journal of Rural Development, 24(2): 49-62. Rahman, M. S., M. A. Kashem and M. S. Islam (1993). Improved Cropping Pattern at Barind area, Rajshahi: A challenge for Maintaining Soil Fertility and Productivity. Bangladesh Journal of Agricultural Sciences, 20(1): 131-134. Rahman, M. M., M. A. Kashem and D. K. Mahfuz (1993). Economic attributed of the Small farmers and Their Use of Institutional Credit. Bangladesh Journal of Extension Education,8(1&2): 47-52. Kashem, m. A., M. Z. Rahman and M. H. Rahman (1992). Credibility of the Block Supervisors as Communicators. Bangladesh Journal of Extension Education, 7(1&2): 23-32. Kashem, M. A. and M. M. Islam (1992). Differences between the Contact and Non-Contact farmers under the Training and visit System: A farm Level Study. Bangladesh Journal of Extension Education, 7(1&2): 95-100. Kashem, M. A. (1992). Krishi Unnayaney Bangladesher Mohila (Women in Agricultural Development in Bangladesh). Newsletter, pp. 17-22. Bangladesh Agricultural University Teachersâ€™ Association â€“ 1991. Bangladesh Agricultural University , Mymensingh. Kashem, M. A. (1991).Opinion Leaders' Knowledgeability and Source Credibility as Communicators of Technical Advice. Bangladesh Journal of Training and Development, 4(2): 61-66. Kashem, M. A. (1991). The Role of Opinion Leaders in the Transfer of Modern Agricultural Technologies to Small Farmers. Bangladesh Journal of Extension Education, 6(1&2): 1-12. Kashem, M. A. (1991). Small Farmers' Opinion on the Measures for Removing of Obstacles to the Adoption of Modern Rice Cultivation Practices. Bangladesh Journal of Extension Education, 6(1&2): 94-104. Kashem, M. A. (1991). Inconveniences in Rice Cultivation as Perceived by small farmers. Bangladesh Journal of Agricultural Sciences, 18(1): 111-117. Kashem, M. A. (1991). Effect of Distance on the Desirable Attributes and Rice Cultivation Obstacles of the Small farmers. Bangladesh Journal of Agricultural Sciences, 18(2): 237-241. Saha, P. K., M. R. Haider, A. Halim and M. A. Kashem (1990). Performance of Contact Farmers under the Training and Visit System. Bangladesh Journal of Training and Development, 3(2): 77-86. Kashem, M. A.(1990). Differences in Knowledge Gain between Pre and Post-test of the Bank Officers. Bangladesh journal of Training and Development, 3(1): 103-103. Kashem, M. A. and M. M. Islam (1990). Comparative Analysis of Knowledge, Attitude and Adoption of Agricultural Practices between the Contact and Non-Contact Farmers under the Training and Visit System. Bangladesh Journal of Extension Education, 5(1&2): 1-7. Kashem, M. A. (1990). Rational Conscientization of the Landless and Small Farmers in Bangladesh. The Bangladesh Rural Development Studies, 11(2): 39-43. Kashem, M. A. (1990). Land Use Pattern in Bangladesh. Bangladesh Journal of Agricultural Sciences, 17(2): 205-207. Kashem, M. A. (1990). Interrelationships of the Characteristics of the Small Farmers. . Bangladesh Journal of Agricultural Sciences, 17(1): 31-38. Hossain, A., M. A. Kashem, A. Halim and M. A. Hossain (1990). Relationships of Selected Characteristics of Extension Personnel with their Problem Confrontation. Bangladesh Journal of Training and Development, 3(2): 69-75. Haider, H.R., M. M. Islam and M. A. Kashem (1990). Contact farmers' Credibility in Disseminating Extension Messages under the Training and Visit System of Extension Work. Bangladesh Journal of Extension Education, 5(1&2): 47-54. Kashem, M. A., A. Hossain, A. Halim and M. M. Islam (1989). Relationships of Selected Characteristics of Extension Personnel with their Problem Confrontation. . Bangladesh Journal of Extension Education, 4(1&2): 65-70. Kashem, M. A. and S. M. A. Hossain (1989). Impact of training in Improving Professional Competency of the Development Communicators towards Rural Development in Bangladesh. The Journal of Rural Development, XIX(2): 99-104. Kashem, M. A. (1989). Correlates of Non-localite Behaviour of Small farmers. . Bangladesh Journal of Extension Education, 4(1&2): 39-44. Mahboob, S. G. and M. A. Kashem (1988). Usefulness of the Small Farmers' Training Programme. Bangladesh Journal of Training and Development, 1(1): 9-16. Kashem, M. A. and S. M. A. Hossain (1988). An Analysis of Training Programme in Soybean Production, Utilization and Extension. Bangladesh Journal of Extension Education, 3(2): 77-81. Kashem, M. A. and G. E. Jones (1988). Small Farmers' Contact with Information Sources and its Relationships with some Selected Characteristics. Bangladesh journal of Extension Education, 3(1): 1-7. Kashem, M. A. and G. C. Sarker (1988). Poultry Problem Confrontation as Faced by the Farmers in Tarundia Union of Mymensingh District. Bangladesh Journal of Animal Science, 17(1&2): 17-22. Kashem, M. A. (1988). Transfer of Technologies in Agriculture: The Obstacles and Consequences. Bangladesh journal of Extension Education, 3(2): 55-64. Kashem, M. A. (1988). Quoting References in Dissertation, Scientific Papers and Reports. Bangladesh Journal of Training and Development, 1(1): 71-77. Kashem, M. A. (1988). Land Ownership Pattern and Tenancy Relationships in Bangladesh. The Journal of Rural Development, XVIII(1): 49-59. Bangladesh Academy for Rural Development, Kotbari, Comilla. Kashem, M. A. (1988). Krishi Samprasaroner Utpatti, Prokriti and Sampratik Chintabhabna (Origin of Agricultural Extension, Nature and its Recent Concept). Krishi Katha ( a monthly development journal in agriculture), 48(3): 123-125. Kashem, M. A. (1988). Factors Responsible for Rice Cultivation Obstacles as Faced by the Small Farmers. Bangladesh Journal of Training and Development, 1(2): 64-73. Kashem, M. A. (1988). Extension's Role towards Agricultural Development. Bangladesh Journal of Extension Education, 3(1): 35-38. Kashem, M. A. (1987). Small farmers' Constraints to the Adoption of Modern Rice Technology. The Bangladesh Development Studies, XV (4):119-130. Kashem, M. A. (1987). Present Problems of Agricultural Extension - A Discussion. Bangladesh journal of Extension Education, 2(Sp. Seminar Issue): 100-103. Kashem, M. A. (1987). History and Development of Agriculture and Advisory Services in Bangladesh - The Past, Present and Future. Bangladesh journal of Extension Education, 2(2): 91-100. Kashem, M. A. (1987). Emancipation of Small Farmers in Bangladesh and the Need for Formation of Their Groups. ADAB News (a Bi-Monthly Development Journal), XI(6): 11-13. Kashem, M. A. (1987). An Analysis of Differences between Adopters and Non-Adopters of High Yielding Varieties of Rice among Small Farmers. Bangladesh Journal of Agricultural Economics, X92): 75-87. Kashem, M. A. (1987). Alternative Approaches to Extension under the Training and Visit (T & V) System in Bangladesh. Bangladesh journal of Extension Education, 2(Sp. Seminar Issue): 67-85. Kashem, M. A. and S. G. Mahboob (1982). Causes of Being Landless of the Landless Labourers. Bangladesh Journal of Agricultural Sciences, 9(2): 143-147. Mahboob, S. G. and M. A. Kashem (1981). Relationships of Economic Characteristics of the Landless Labourers with their Problem Confrontation. Bangladesh Journal of Agricultural Sciences, 8(2): 133-145. Kashem, M. A. and S. G. Mahboob (1981). Relationships of Selected Personal and Psychological Characteristics of the Landless Labourers with their Problem Confrontation. Bangladesh Journal of Agricultural Sciences, 8(2): 181-190. "Problems of landless, reasons for being landless, and means for improving the conditions of the landless as perceived by them". Presented the paper at the national workshop on How to Reach Small and Landless Farmers held at the Bangladesh Agricultural University, Mymensingh, organized by the Association of Development Agencies in Bangladesh (ADAB) on 20 November 1979. "An Investigation on the Small Farmers' Training Programme conducted at the Agricultural Training Institute (ATI), Tajhat, Rangpur". Presented the paper at the 6th and 7th Annual Bangladesh Science Conference of the Bangladesh Association for the Advancement of Science (BAAS) held at the Bangladesh Agricultural Research Institute (BARI), Joydebpur, Gazipur during 7 - 11 February 1982. "Relationships of Selected Economic Characteristics of the Landless Labourers with their Problem Confrontation". Presented the paper at the 6th and 7th Annual Bangladesh Science Conference of the Bangladesh Association for the Advancement of Science (BAAS) held at the Bangladesh Agricultural Research Institute (BARI), Joydebpur, Gazipur during 7 - 11 February 1982. "Population Control for Agricultural Development in Bangladesh". Presented the paper at the Seminar Organized by the Faculty of Agriculture, Bangladesh Agricultural University (BAU), Mymensingh on 27 February 1982. "Problems in Conducting Extension Work with the Farmers". Presented the paper at the First Krishibeed Convention organized by the Krishibeed Institute, Bangladesh, Dhaka during 12 - 13 February 1982. "Samprasaron abong Palli Unnayan Karzakromey Janasankha Shikkhar Samannoy" (Integration of Population Education in Extension and Rural Development Activities), delivered the speech at the Farm Broadcasting Forum of Radio Bangladesh on September 8, 1982, Dhaka, Bangladesh. "A Study on the Landless: Cause of Being Landlesssness". Presented the paper at the 8th Annual Bangladesh Science Conference of the BAAS held at Dhaka University during 5 - 9 February 1983. "Present and Anticipated Future Situation of Agricultural Education at the Primary, Preparatory, secondary and Post-secondary levels in Bangladesh". Presented the paper at the Annual National Conference of the Bangladesh Krishi Shikshabeed Sammittee held the Bangladesh Agricultural Research Council (BARC), Dhaka on9 April 1983. "Extension Research on the Use of Institutional Credit by Small Farmers". Presented the paper at the 20th Anniversary of AERDC Conference on Investing in Rural Extension: Strategies and Goals held at the University of Reading, UK during 15 - 21 September 1985. "Alternative Approaches to Extension under the framework of the Training and Visit (T&V) System in Bangladesh". Presented the paper at the First National Seminar on Agricultural Extension organized by the Bangladesh Agricultural Extension Society (BAES), Dhaka, Bangladesh during 11 - 12 February 1987. "Role of Extension Research Towards Agricultural Development". Presented the paper at the National seminar on Agricultural Education and Research organized by the BAAS Local Chapter, Mymensingh on 10 November 1988. "Possibility of Self-sufficiency in Food through Rice Production in Bangladesh". Presented the paper at the 14th annual Bangladesh Science Conference of the BAAS held at the Bangladesh Rice research Institute (BRRI), Joydebpur, Gazipur during 29 January to 01 February 1989. "Impact of Training in Improving Professional Competency of the Development Communicators towards Rural Development in Bangladesh". Presented the paper at the 14th Annual Bangladesh Science Conference of the BAAS held at the Bangladesh Rice research Institute (BRRI), Joydebpur, Gazipur during 29 January to 01 February 1989. "Role of Opinion Leaders in Technology Transfer to Small Farmers". Presented the paper at the Workshop on BAU Research Progress 189-90 during 15 - 18 January 1991 at BAU, Mymensingh. "Prevention of Post-harvest Losses in Foodgrains â€“ A Discussion". Presented the paper at the National Workshop on Training of Rural Women for Postharvest Loss Prevention held at the Bangladesh Agricultural Research Institute (BARI), Gazipur during 24 - 25 July 1991. "Progress and Constraints in Technology transfer". Presented the paper at the First Biennial Conference of the Crop Science of Bangladesh held at BAU, Mymensingh during 18 - 20 January 1992. "Farmers' Use of Communication Media in the Adoption of Modern Agricultural Technologies". Presented the paper at the First Biennial Conference of the Crop Science of Bangladesh held at BAU, Mymensingh during 18 - 20 January 1992. "Potentials and Constraints of Production and Marketing of Seeds of oil Crops in Bangladesh". Presented the paper at the National Workshop on Oilseed Research and development in Bangladesh held the Bangladesh Agricultural Research Council (BARC), Dhaka during 26 29 April 1992. "Farmers'Use of Communication Media in Adopting Agricultural Technologies - A Farm Level study in Bangladesh". Presented the paper at the 18th General Assembly and Scientific Conference of the IAMCR (International Association for Media and Communication Research) held at Guaruza, Sao Paolo, Brazil during 16 - 21 August 1992. "Women in Agriculture". Presented the paper in the seminar on Agriculture and Society organized by the Krishibeed Institution, Local Chapter, Mymensingh on 18 November 1993. "Change Agents' Credibility as Communicators of Technical Advice". Presented the paper at the 18th Annual Bangladesh Science Conference of the BAAS held at BAU, Mymensingh during 22 - 24 June 1994. "Implications of Environmental and Sustainability Issues for the Organization and Practice of Agricultural Extension". Presented the paper in the workshop on Sustainable Development in Agriculture organized by the University of Reading, UK, ODA, UK during 14 January to 04 February 1995. "Manpower Development in Extension in Respect of Sustainable Agricultural Development - An Experience from Bangladesh". Presented the paper at the National Workshop on Manpower Development in Extension Education for Meeting Future Challenges of Agriculture organized jointly by the NAARM (National Academy of Agricultural Research Management), Hyderabad, India, and Indian Society of Extension Education (ISEE) during 13 - 16 February 1995. "Gender Research and Training". Participated at the Workshop organized by the Bangladesh Agricultural Research Council (BARC), Dhaka during 25 - 26 May 1996. "Problems Faced by the Resourceless Women in Participating in Group Activities". Presented the paper at the 20th General Assembly and Scientific Conference of the IAMCR (International Association for Media and Communication Research) held at Sydney, Australia during 18 - 22 August 1996. "Combating Environmental Degradation in Bangladesh: New Urge for Sustainable Agricultural Technologies". Presented the paper at the Keyodo Seminar organized by the Faculty of Applied Biological Science, Hiroshima University, Higsahi-Hiroshima, Japan on 17 July 1997. "Agricultural Extension Services in Japan and Bangladesh: Lessons Learned and Future Strategies". Presented the paper at the seminar organized by the Bangladesh Agricultural Extension Society (BAES), Bangladesh Agricultural University, Mymensingh on 28 June 1998. "Farmers' Contact with Information Sources with regard to their Use of Indigenous Technologies in Crop Production: Empirical Findings from Bangladesh and Japan". Presented the paper at the 21st General Assembly and Scientific Conference of the IAMCR (International Association for Media and Communication Research) held at Glasgow, Scotland, UK during 26 - 30 July 1998. "Comparative Use of Personal Cosmopolite and Mass Media in Using Indigenous Technical Knowledge (ITK) by the Farmers in Bangladesh". Presented the paper at the NCDC (National Council of Development Communication) XIIth Bi-Annual Meet and General Assembly: 50 Years of Communication Research organized by the NCDC, New Delhi, India during 4 - 7 August 1998. "Potentials for Privatizing Agricultural Extension in Bangladesh in the 21st Century". Presented the paper at the symposium on Agricultural Extension Services in the 21st Century: Needs and Challenges organized by the Bangladesh Agricultural Extension Society (BAES), Bangladesh Agricultural University , Mymensingh during 15 to 18 May 1999. "Agricultural Extension Services in Japan and Bangladesh: Lessons Learned and Future Strategies". Presented the paper at the seminar organized by the School of Environment, Resources and Development (SERD) of the Asian Institute of Technology (AIT), Bangkok, Thailand on 22 June 1999. "Technologies Developed by the Bangladesh Agricultural University (BAU), Mymensingh". Presented the paper at the workshop organized by the Bangladesh Agricultural Research Council (BARC), Dhaka during 28 to 29 June 1999. "Communication Behaviour of Banana Growers - An Empirical Study in Bangladeshâ€. Presented the paper at the 22nd General Assembly and Scientific Conference of the IAMCR (International Association for Media and Communication Research) held at the Nanyang Technological University and AMIC (Asian Media Information Communication Centre), Singapore during 17 - 20 July 2000. "Challenges in Extension Approaches and Methods in Bangladesh". Presented the paper at the seminar organized by the Department of International and Rural development, The University Of Reading, UK on 19 July 2001. "Use of Television as a Community Media by the Farmers in Bangladesh". Presented the paper at the International Inaugural Media Conference organized by the British Film Institute, July 2001. "Role of Educational Institutions in Implementing NAEP: A Review". Presented the paper at the National Workshop on Implementing the New Agricultural Extension Policy, organized by the Bangladesh Agricultural Extension Society (BAES) during 26 - 28 January 2002 hosted at the Bangladesh Agricultural University, Mymensingh. "Lifelong Learning: The Experience of the Bangladesh Agricultural University". Presented the paper at the fifth Annual Scientific Conference on Role of Life-Long Learning in Professional Development organized by Chittagong Veterinary and Animal Sciences University at hotel Agrabad, Chittagong during 13 - 14 March 2007. "Use of Communication Media for Disaster Preparedness in Agricultural Sector in Bangladesh". Presented the paper at the 26th World Congress of the International Association for Media and Communication Research (IAMCR) on "Media and Global Divides" held at the Stockholm University, Sweden during 20 to 25 July 2008. "Experience of global advancement in knowledge management and technology transfer process in Bangladesh". Presented the paper at the seminar organized by the SAARC Secretariat, Bangladesh Agricultural Research Council, Dhaka, Bangladesh on 20 May 2008. "Global Advancement in Knowledge and Information Management for Meeting Farmers' Needs with special emphasis to Technology Transfer Process in Bangladesh". Presented the paper at the Agricultural Extension Conference 2009 on Experiences & Challenges in Agricultural Extension: Meeting Farmer Needs at Plant Genetic Resources Centre, Peradeniya, Sri Lanka during 27 - 28 August 2009. "Farmers' use of Mobile phones in Receiving Agricultural Information towards Agricultural Development". Presented the paper at the 2nd International Conference on M4D: Mobile Technology for Development at Kampala, Uganda during 4 - 12 November 2010. "Use of Indigenous Technical Knowledge (ITK) by the Rural Women in Bangladesh for the Production and Preservation of Crops and Domestic Animals". Presented the paper at the International Seminar on Society, Politics and Climate Change (SOPOC 12) at the Nagindas Khandwala College of Commerce, Arts & Management Studies & Shantaben Nagindas Khandwala College of Science, Malad (W), Mumbai during 3 to 4 December 2012. "Diversified Use of Mobile Phones by the Farmers in Bangladesh for Receiving Agricultural Information". Presented the paper at the International Conference on "Artificial Intelligence and Soft Computing" (AISC-2012) organized by the Department of Computer Engineering, Indian Institute of Technology (IIT), Banaras Hindu University (BHU), Varanasi, India during 7 to 9 December 2012. "Potentials for Using Indigenous Technical Knowledge (ITK) fir Combating Problems Arising due to Climate Change". Presented the paper at the International; Conference organized by the Bangladesh Agricultural Extension Society (BAES), Department of Agricultural Extension (DAE) and Comprehensive Disaster Management xProgramme (CDMP) during 7 - 8 March 2013 hosted at the Bangladesh Agricultural University, Mymensingh. "Effectiveness of Social Safety Net Programs for the Rural poor in Vulnerability Situation". Presented the paper at the International Conference on "Artificial Intelligence and Soft Computing" (AISC-2012) organized by the Department of Computer Engineering, Indian Institute of Technology (IIT), Banaras Hindu University (BHU), Varanasi, India during 7 to 9 December 2012. "Challenges In Higher Agricultural Education In Bangladesh". Paper was presented at the SAARC Regional Expert Meeting on National Agricultural Education Systems held during 28 - 30 October 2013 at the Sher-e-Bangla Agricultural University, Sher-e-Banglanagar, Dhaka -1215. Participated in the Network Meeting on "Agricultural Extension Association in South Asia" held in Kathmandu, Nepal during 14 to 15 January 2014. "Risks In Agriculture: Impact of Weather on T. Aman, Boro Rice and Potato Production in Bangladesh". Paper presented at the "Capacity Building Workshop on Weather Index Based Crop Insurance (WIBCI) in Bangladesh" at Western Age Heritage Hotel, Chittagong during 19 - 21 December 2016. Kashem, M. A. (2012). Effectiveness of Mobile Phones as Communication Media to Poultry farm Owners in Bangladesh. Pp. 130-133 in: Vikas Kumar and Jacob Svensson (eds) Proceedings of MD2012, 28-29 February 2012, New Delhi, India. Kashem, M. A. (2010) Farmers’ use of Mobile Phones in Receiving Agricultural Information towards Agricultural Development. Pp. 80-89 in: Jakob Svensson and Gudrun Wicander (eds.) Proceedings of The 2nd International Conference on M4D Mobile Communication Technology for Development (M4D 2010), 10-11 November 2010 Kampala, Uganda: Karlstad University Studies, 2010:31. Sweden. Kashem, M. A. (2009). “Global Advancement in Knowledge and Information Management for Meeting Farmers’ Needs with special emphasis to Technology Transfer Process in Bangladesh”. Background paper of the proceedings of Agricultural Extension Conference 2009 on Experiences & Challenges in Agricultural Extension: Meeting Farmer Needs. Plant Genetic Resources Centre, Peradeniya, Sri Lanka. Kashem, M. A. (2007). “Use of Television as a Community Media by Farmers in Bangladesh”, pp. 69-76 in: Fuller, Linda K. (Ed.) Community Media: International Perspectives. New York: Palgrave Macmillan. Kashem, M. A. (2005). “Strategies and Approaches for Empowering Women in Bangladesh” pp. 117-129 in: R. K. Samanta (ed) Empowering Rural Women: Issues, Opportunities and Approaches. New Delhi: The Women Press. Kashem, M. A. & M. A. Sarkar (2005). “Secondary Information and Analysis on Food Security and Hunger in Bangladesh”, pp. 21-65 in: Survey on Food Security and Hunger in Bangladesh. Dhaka: RDRS (Rangpur Dinajpur Rural Service) Bangladesh. Kashem, M. A. (2004). Fundamentals of Extension Education. Mymensingh: Lima Printing Press. Kashem, M. A. (1993). Appropriate Extension Strategies for Developing Countries: The Case of Bangladesh. Pp. 29-50, in: R.K. Samanta (ed) Extension Strategy for Agricultural Development in 21st Century. New Delhi: Mittal Publications. Kashem, M.A. (1992). Samprasaron Biggan (Extension Science). Dhaka: Bangladesh Packing Press Limited. Kashem, M. A. (2010) Farmers' use of Mobile Phones in Receiving Agricultural Information towards Agricultural Development. Pp. 80-89 in: Jakob Svensson and Gudrun Wicander (eds.) Proceedings of The 2nd International Conference on M4D Mobile Communication Technology for Development (M4D 2010), 10-11 November 2010 Kampala, Uganda: Karlstad University Studies, 2010:31. Sweden. Kashem, M. A. (2009). "Global Advancement in Knowledge and Information Management for Meeting Farmers' Needs with special emphasis to Technology Transfer Process in Bangladesh". Background paper of the proceedings of Agricultural Extension Conference 2009 on Experiences & Challenges in Agricultural Extension: Meeting Farmer Needs. Plant Genetic Resources Centre, Peradeniya, Sri Lanka. Kashem, M. A. (2007). "Use of Television as a Community Media by Farmers in Bangladesh", pp. 69-76 in: Fuller, Linda K. (Ed.) Community Media: International Perspectives. New York: Palgrave Macmillan. Kashem, M. A. & M. A. Sarkar (2005). "Secondary Information and Analysis on Food Security and Hunger in Bangladesh", pp. 21-65 in: Survey on Food Security and Hunger in Bangladesh. Dhaka: RDRS (Rangpur Dinajpur Rural Service) Bangladesh. Commonwealth Scholarship during 1983 to 1986 for higher studies leading to Ph.D. degree. As a Research Fellow visited the Department of Agricultural Extension and Rural Development, The University of Reading, UK during 14 January to 08 February 1997. JSPS (Japan Society for the Promotion of Science) Invitational Research Fellowship during 1997 - 98 for conducting research in Japan. As a Research Fellow visited the International and Rural Development Department, The University of Reading, UK during 9 to 22nd July 2001. Self-Assessment (SA) of Bachelor Degree Program of the Faculty of Agriculture, Bangladesh Agricultural University, Mymensingh. Funded by: World Bank administered by the University Grants Commission of Bangladesh (UGCB). Description: Self-Assessment (SA) of Bachelor Degree Program of the Faculty of Agriculture, Bangladesh Agricultural University, Mymensingh. Determination of factors responsible for yield Gaps in rice and wheat at farmer's field. Description: Determination of factors responsible for yield Gaps in rice and wheat at farmer's field. Factors affecting the adoption of aquaculture technologies by the farmers. Description: Factors affecting the adoption of aquaculture technologies by the farmers. Communication Behaviour and Job Performances of Male and Female Block Supervisors Working under the DAE. Description: Communication Behaviour and Job Performances of Male and Female Block Supervisors Working under the DAE. Upgrading the Curriculum and Research on the Impact of Extension Reforms at the Department of Agricultural Extension Education, Bangladesh Agricultural University, Mymensingh. Description: Upgrading the Curriculum and Research on the Impact of Extension Reforms at the Department of Agricultural Extension Education, Bangladesh Agricultural University, Mymensingh. The project was administered jointly by the Department of Agricultural Extension Education, Bangladesh Agricultural University, Mymensingh and International and Rural Development Department (IRRD), University of Reading, UK. Towards Sustainable agricultural Development: Use of Indigenous Technical Knowledge (ITK) by the Farmers of Selected Areas of Bangladesh and Japan for the Production, Protection, and Preservation of Crops, Animals, and Fishes. Description: Towards Sustainable agricultural Development: Use of Indigenous Technical Knowledge (ITK) by the Farmers of Selected Areas of Bangladesh and Japan for the Production, Protection, and Preservation of Crops, Animals, and Fishes. Implications of Environmental and Sustainability Issues for the Organization and Practice of Agricultural Extension. Description: Implications of Environmental and Sustainability Issues for the Organization and Practice of Agricultural Extension. The other collaborative partners of the project were: (i) The University of Reading, UK, (ii) Visayes State College of Agriculture (VisCA), The Philippines, (iii) University of Agricultural Sciences (UAS), Bangalore, India, and (iv) The Annamalai University, Tamil Nadu, India. Block Supervisor's Credibility as Communicators of Technical Advice. Description: Block Supervisor's Credibility as Communicators of Technical Advice. Adoption and Communication Behaviour of Sugarcane Growers around Zil-Bangla Sugarmill Area in Bangladesh. Description: Adoption and Communication Behaviour of Sugarcane Growers around Zil-Bangla Sugarmill Area in Bangladesh. Use of Communication Media in the Transfer of Technologies to Farmers. Description: Use of Communication Media in the Transfer of Technologies to Farmers. Role of Opinion Leaders in Technology Transfer to Small Farmers. Description: Role of Opinion Leaders in Technology Transfer to Small Farmers. Obstacles to the Adoption of Modern Rice Cultivation Practices by Small Farmers of Bangladesh. Description: Obstacles to the Adoption of Modern Rice Cultivation Practices by Small Farmers of Bangladesh.